This week my photo shoot in dad's garden was a bit of a wash out. It rained and poured for the entire time I was visiting. Not to be put off by a bit of wet though, I ventured out into the downpour to capture a few record shots. 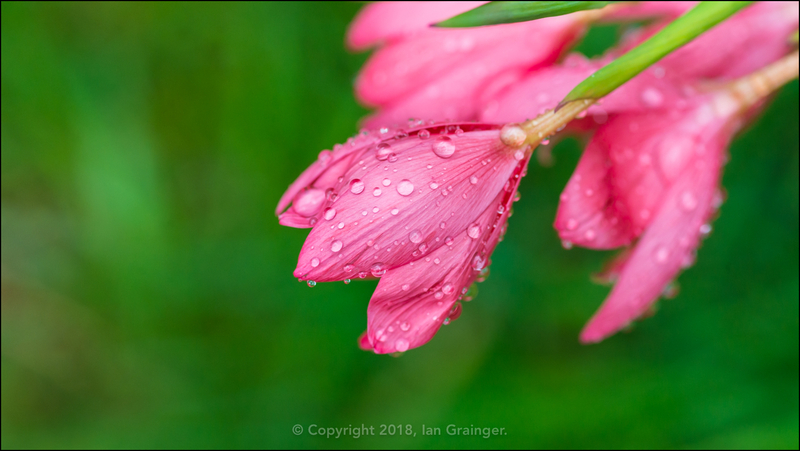 I thought these River Lilies (Hesperantha coccinea) were appropriately named for the weather conditions. I don't think I could have got much wetter if I'd been standing in the middle of a river as I snapped away at these beauties! 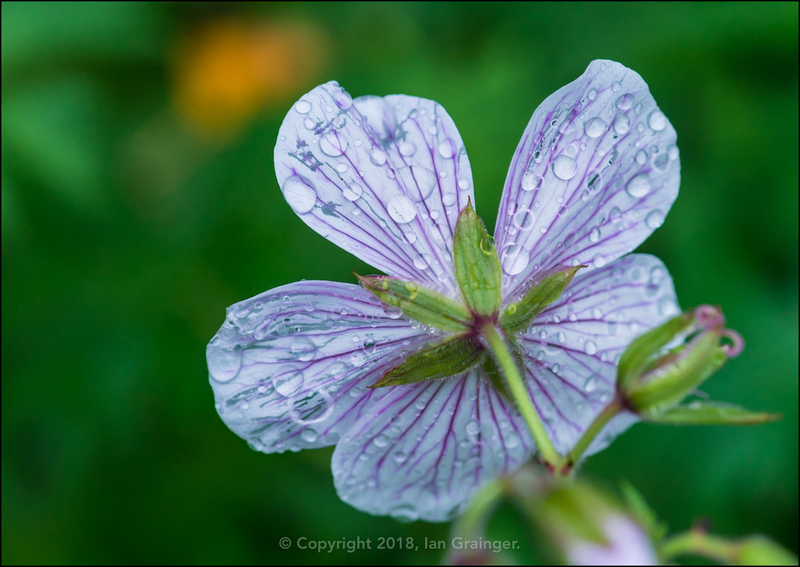 Next up were these very out of season Hardy Geranium (Geranium clarkei) blooms, which I thought looked quite pretty with the reverse side of their petals covered in raindrops. 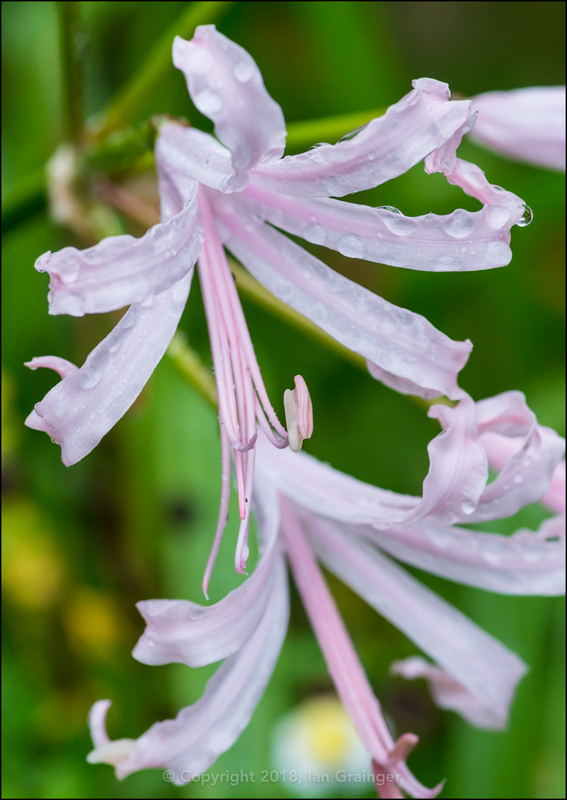 A new Nerine (Nerine bowdenii) had appeared since last week, but I'd be willing to bet that another week under wraps would've been much better for it. 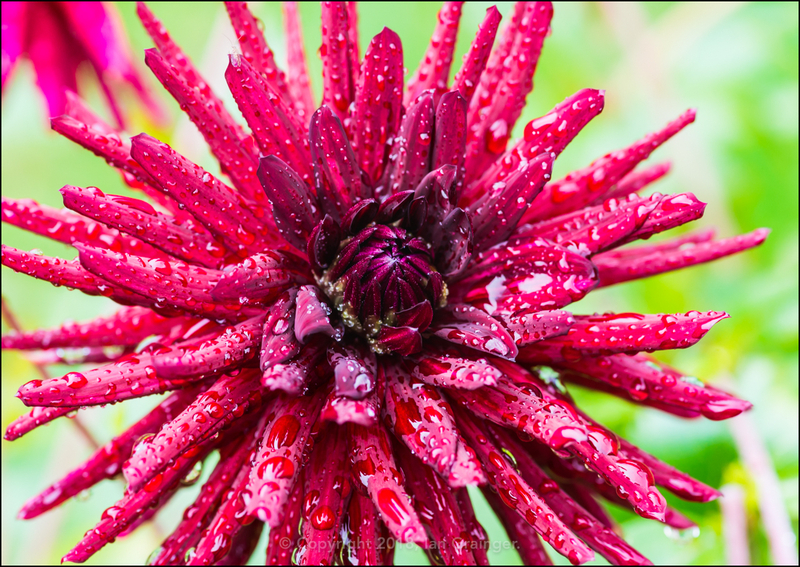 The stems were already beginning to sag under the weight of the heavy flower heads as they clung onto the raindrops. 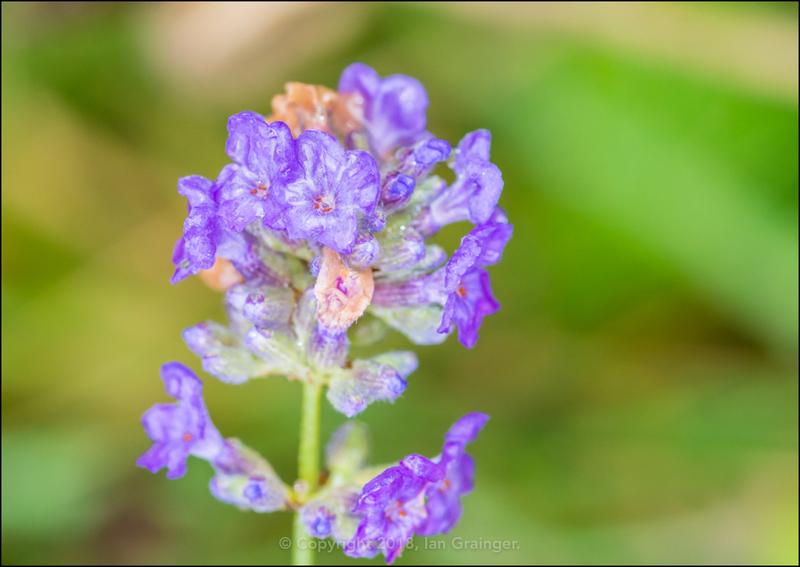 I thought the Lavender (Lavandula) had finished for the year, but found a few flower heads lurking beneath a patch of long grass. The Dahila 'Nuit d'Ete' blooms were coming thick and fast again, having fully recovered from the storms of a few weeks ago. They'd been saved from last week's high winds by the judicious use of lots of bamboo stakes. 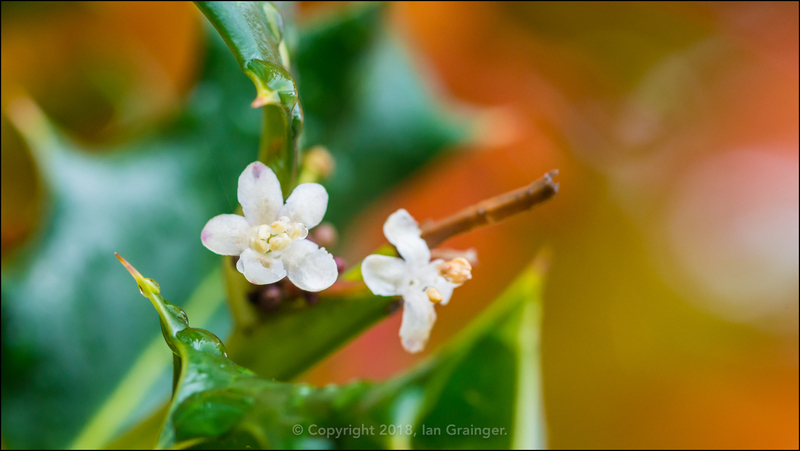 The tiny blooms of the Holly (Ilex) bushes continued to appear. I really liked how they looked against the Autumnal looking leaves of an Acer palmatum tree in the background of this photo. 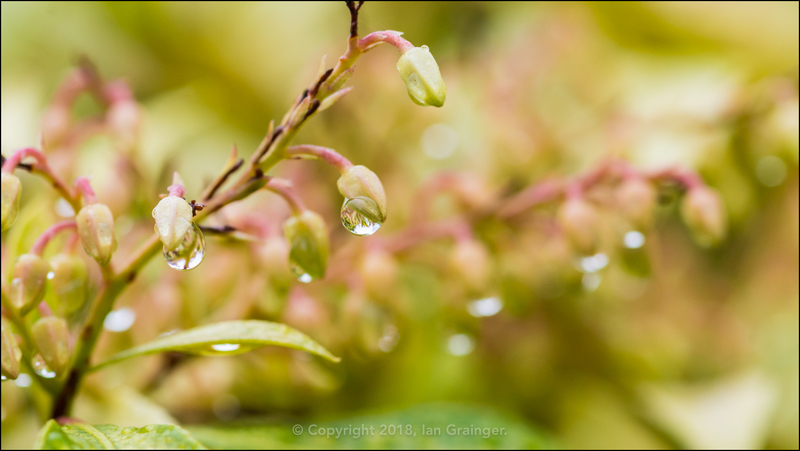 More out of season madness continued as the Spring flowering Forest Flame (Pieris) bush continued to produce flower buds, albeit very wet ones. 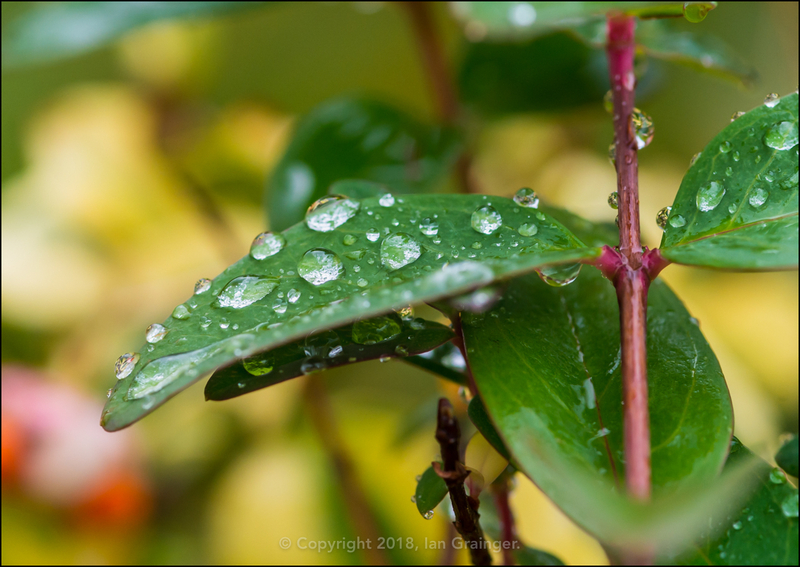 Raindrops were everywhere, and I quite liked how you could see how they were stacked on the various levels of leaf in this shot. 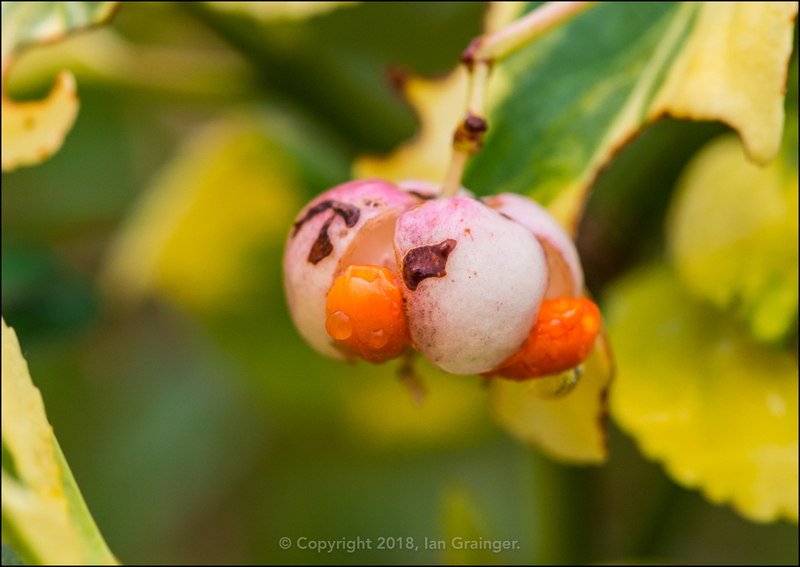 Berry season continued, and this week it was the turn of the Spindle (Euonymus europaeus) bushes to start producing theirs. 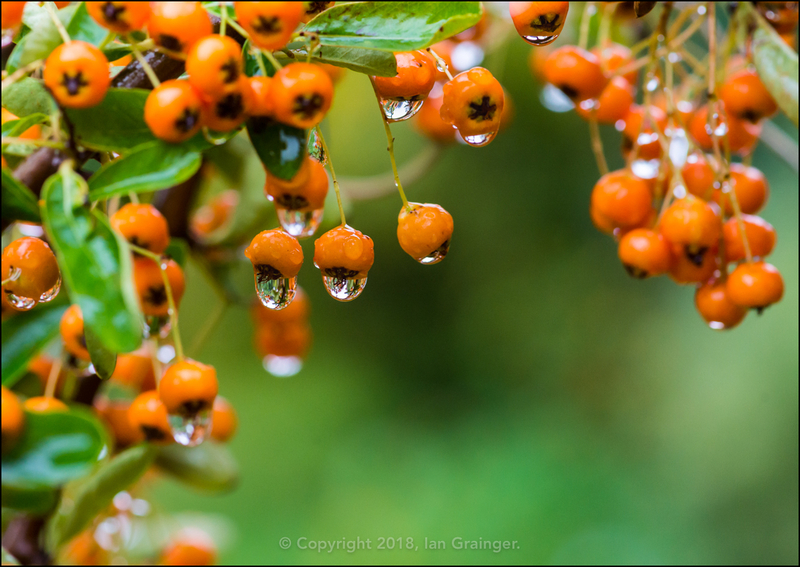 The Firethorn (Pyracantha) bush berries had finally ripened, and some had been stripped away by the birds already. Unfortunately I couldn't capture any of that activity as the rain was keeping the birds from flying. 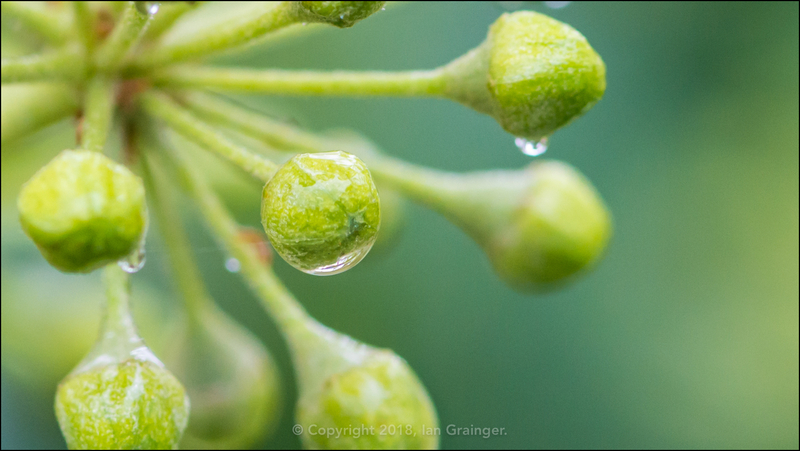 I was quite intrigued how a raindrop had completely engulfed this developing Common Ivy (Hedera helix) berry. It was like the berry was actually inside the raindrop. It's that time of year again when different kinds of fungus are found growing in dank, dark places! This rather large mushroom was found growing in a dark corner of the garden lawn. 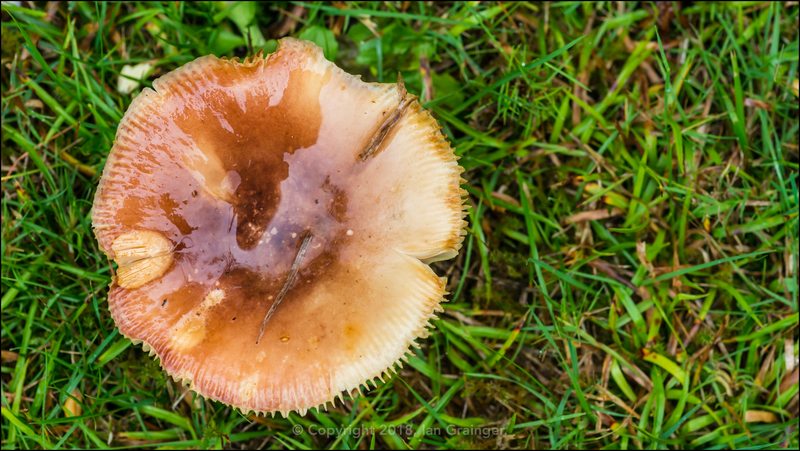 I think it's from the Russula genus, which comprises over 700 different species, although I don't know for sure. To my fishy friends, and for the third week running I'm dipping into my archive of fishy photos! 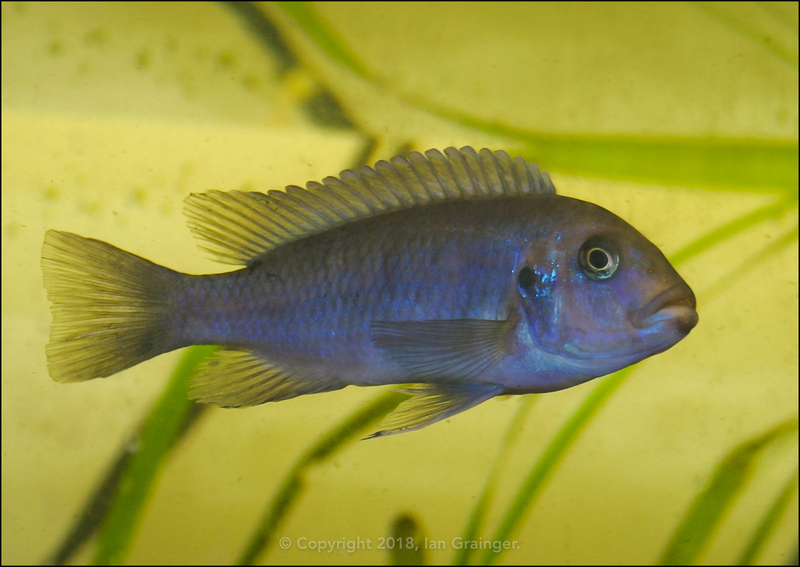 This week I'm showcasing this lovely little Cobalt Blue Zebra (Maylandia callainos). I had a small group of these in a rocky Lake Malawi set-up quite a few years ago. I housed them along with other Mbuna species in an overstocked tank to keep aggression levels down. However, because of the overstocking, it was a lot of work to keep Nitrate levels low, requiring at least two 50% water changes a week. I'd only recommend keeping any Mbuna species if you have the experience, and willingness to put the time into looking after them.